I fished hard this past weekend. I was inspired by a comment by blog reader Evan R on Jo’s ‘Bucket List’ post to do my own little “tour de New Hampshire” so I contacted one of my college roommate and came up with fishing plans. This is the first leg of my “tour” as I plan to explore more rivers and brooks in the coming weeks before school starts. Enjoy! I woke up early in the morning, packed a delicious lunch, and headed up into the White Mountains. I followed suit with my usual plan of exploring new streams. 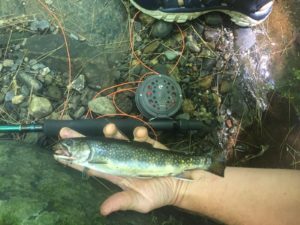 My first stream of choice was reputed to be one of the best native streams in New Hampshire. The stream lived up to its reputation that morning as it provided many fish as well as some decent fish. Early on, I lost/missed a couple slow strikes on dries but I began nailing them as soon as I switched up to a nymphing set up. 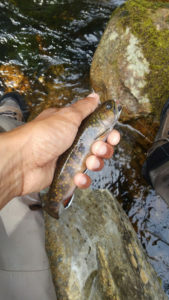 Often times, nymphing is the way to go on mountain streams from 8 am- 10 am since the nighttime temps still leave the fish in a sluggish mood. Each pool I fished seemed to hold 4-6 fish in it. They were colored up very beautifully and fought nicely for their size. I would like to come back early in the fall to catch these fish in the prespawn but I don’t imagine they can be more gorgeous (pics below). As soon as I caught a decent enough number to call the morning a success, I switched over to dries. This is where things started to get tricky. I caught a decent number of fish but I missed MANY. Most would launch themselves out of the water suicidally for a dry fly only to miss it entirely and some would mouth it very lightly before refusing it. All in all, it was a great morning and after I reached my car, I ate a quick lunch before leaving. After lunch, I decided to hit the upper fly fishing only section of the Ellis River. I’ve had great luck in multiple spots on the upper section but I decided to try my luck further down since I heard that natives were being caught due to an error in stocking. Unfortunately, 2 hours produced nary a strike or fish seen. All I saw were tiny dace in the backwaters. My spirits were dampened but I wasn’t crushed. 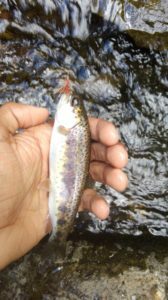 On the way to my roommate’s house, I hit a small feeder along the Kancamangus for 15 mins. and I caught 4 small (in fact tiny) natives on dries. 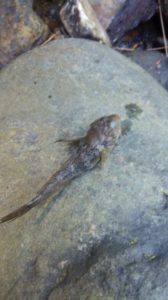 These fish were as native as they get. We woke up and hit a couple of small streams near his house. Our original plan was to hit either the Sugar or Mascoma rivers but since it was sunny and clear, we opted for smaller, shaded creeks. Unlike what I saw further north in the White Mountains, the water was low there. The first creek was only a 2 minute drive away from my roommate’s house and one of his favorites. The fishing was tough due to the low water conditions and the overgrown vegetation, but I enjoyed the challenge. 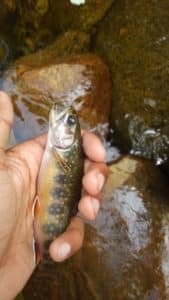 I caught 2 brookies and my roommate (Pete) caught 3. They were hiding out in undercuts and in broken and deep water, which there was very little of. All fish were native and they all fought hard. We tried a few other spots on the creek, but since they were too low and clear to hide any fish, we decided to switch spots. The second creek we fished was another one that Pete had fished before. On the way to the spot he wanted to try, we passed a section in a deep gorge that we decided was worth a shot. The hike down and up was treacherous but the fishing was great so we decided to stick around. 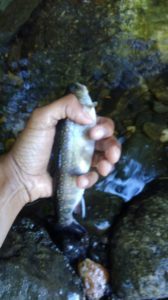 To our surprise, we caught wild rainbows and we saw one brookie in a popular swimming hole that must have been at least 14 in.! This stream was also unstocked and the fish were all 100% wild and native. All said and done, I had a great weekend. Although I felt tired and sore, the entire experience was worth it. Next weekend, I hope to explore further up the Great North Woods and I hope to try the Androscoggin and Nash Stream. If anyone has any suggestions or comments about either of these places, please let me know below. Sounds like you had a great adventure. Awesome write up Ashu, sounds like it was a great time! Glad i could provide some inspiration! Have you ever fished the Wild River? It is, as the name suggests, an incredibly wild and remote river in the whites with some nice fish in it! I spent a night there last year and fished the following morning, but would like to go back for a whole weekend this year. Thanks Evan! As a matter of fact, I did try the wild once last October but it was bony and I didn’t get anything so I left after a few minutes. It was beautiful and wild country and I plan on returning. I heard this year, the fishing, much like everywhere else has been good there. I would call into North Country Angler and talk to Steve Angers to inquire how the fishing’s been first. It’s a long drive but if one spot doesn’t work, the next 10 do! That’s great to hear! Last year was tough fishing for sure. I was up that way a few weeks ago and panicked when I didn’t see NCA in their usual spot, I didn’t realize they moved to a new location! Well done up in the mountains, Ashu. I’m glad you connected plenty on those beautiful wild trout.